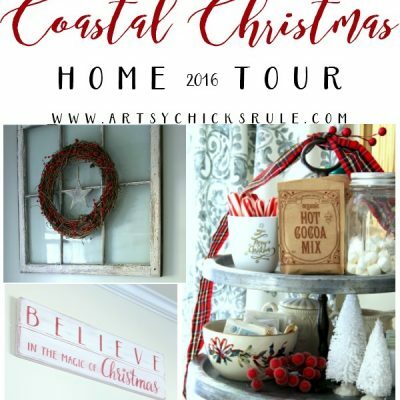 I’m sharing part 1 of my Coastal Christmas Home Tour today. There will be 3 parts that I’ll be sharing this week and finishing up next week. I kept it mostly simple this year and more traditional. There’s just something about the traditional red and white. The new white slip covered furniture ended up looking so great with all of the red decor. 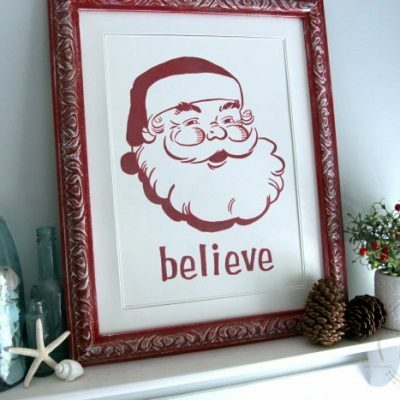 If you follow along on Instagram, you’ve already been seeing little bits of my Christmas decor already. I’ve been sharing over there for a couple weeks already. If you don’t follow, I’d love to connect with you over there! Anyway, as I said, I had to split it up into 3 parts to be able to share it all without being photo heavy in the posts. 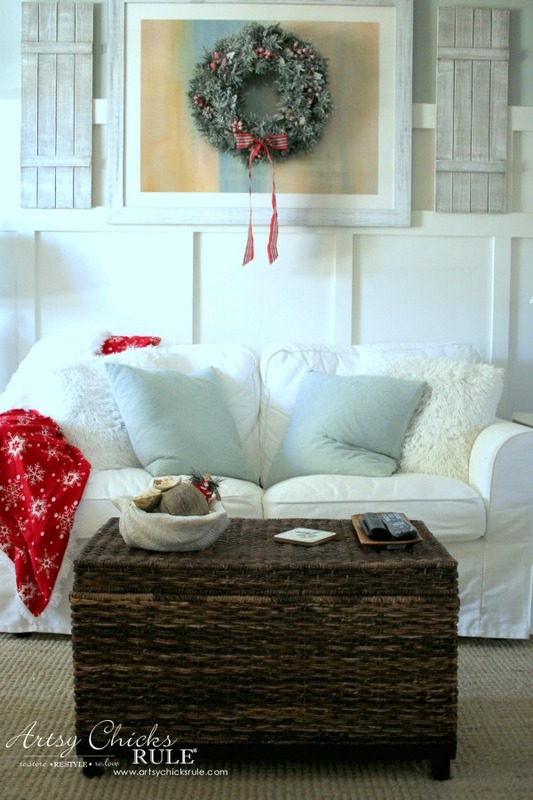 Today I’m sharing my family room. I’ll be sharing my kitchen and dining room on Thursday. I’ll finish up next week with my study, foyer and snippets of our porch. 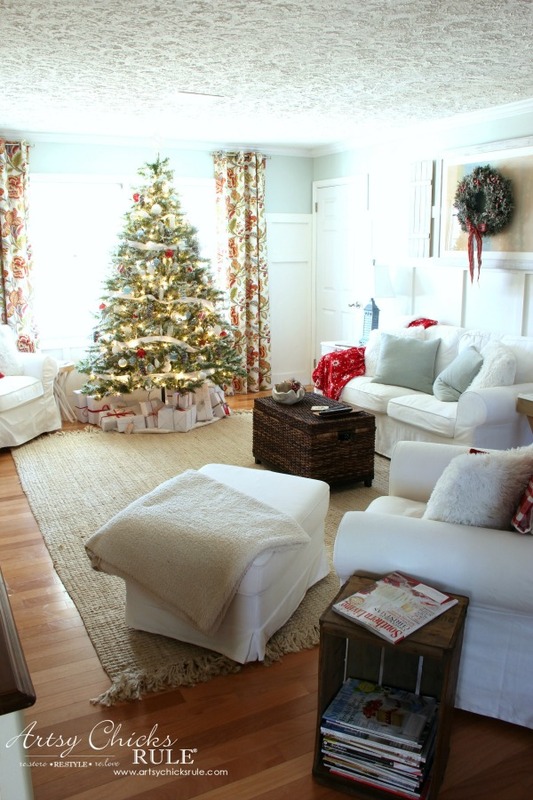 Here’s our “red & white” Coastal Christmas Home (family room)…. But I wanted to keep things simple this year and that meant one tree was enough. Do you see the little “side table” there beside the chair? That is actually a crate from 1933 and I found it when my husband and I went to a street market a few weeks ago. I LOVE it! I wasn’t sure what I’d do with it and then sat it beside the chair and loved it there. I especially love having it to the open side and filled with magazines for reading. 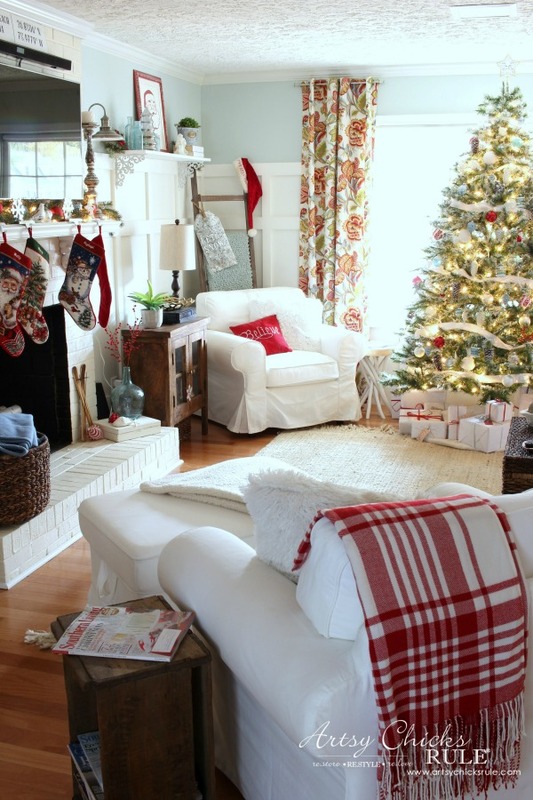 And who doesn’t love plaid for Christmas? I adore this throw I picked up at TJ Maxx recently. I think the red goes so nicely as it brings the red/coral colors out of the curtains. The red pillows came from Michael’s a year or so ago. 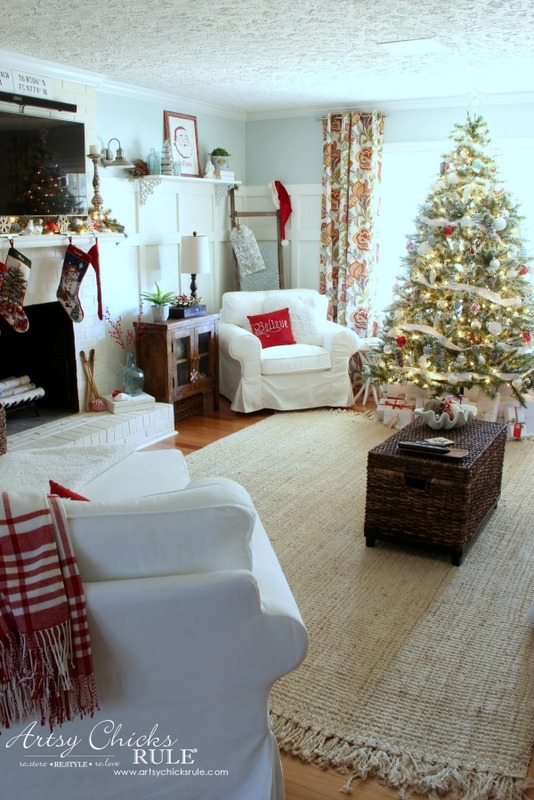 That red and white, sigh, I just love it. 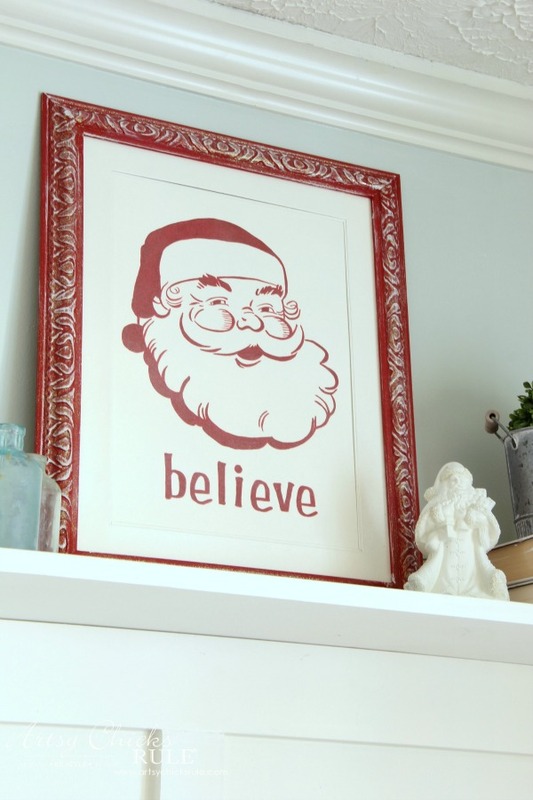 I painted the “Santa Believe” sign up there on the shelf a few years ago. I love moving things around from year to year. 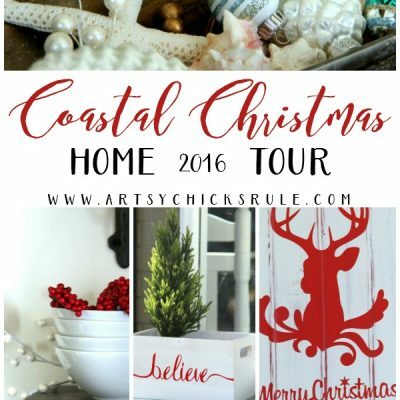 I’ll be linking up last year’s Christmas Tour if you’d like to see how I used all of these things then. The ladder is also new. 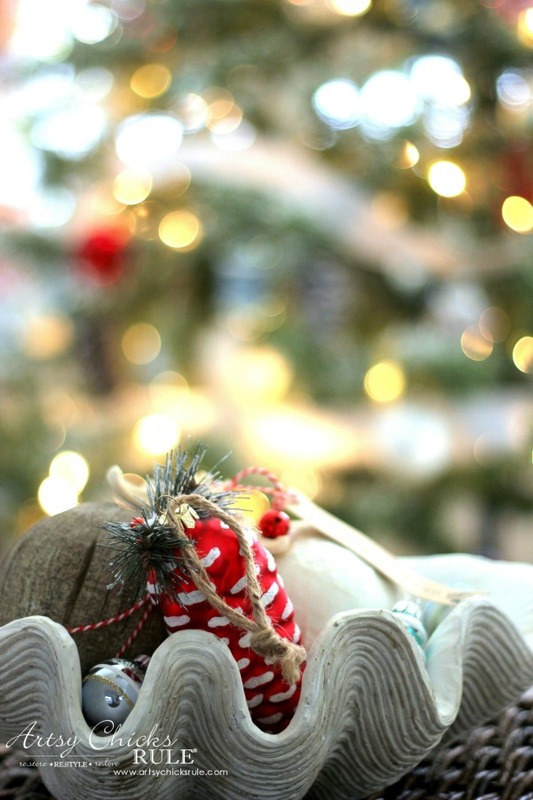 I’m so excited about it and will be sharing the super, simple DIY in the new year. Ryder wanted in on the action. Well, maybe or maybe not. ;) He was just such a good boy to stay so I could take his photo. 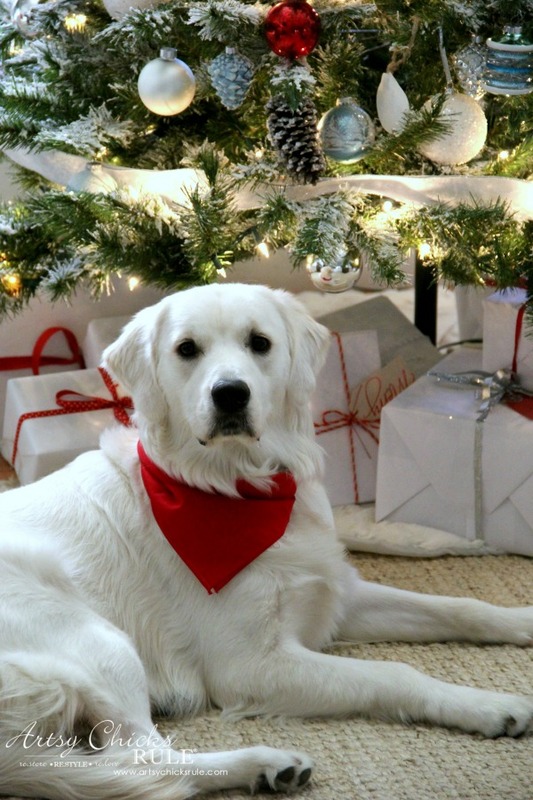 And of course I had to get him a red bandanna so he could be red and white too! 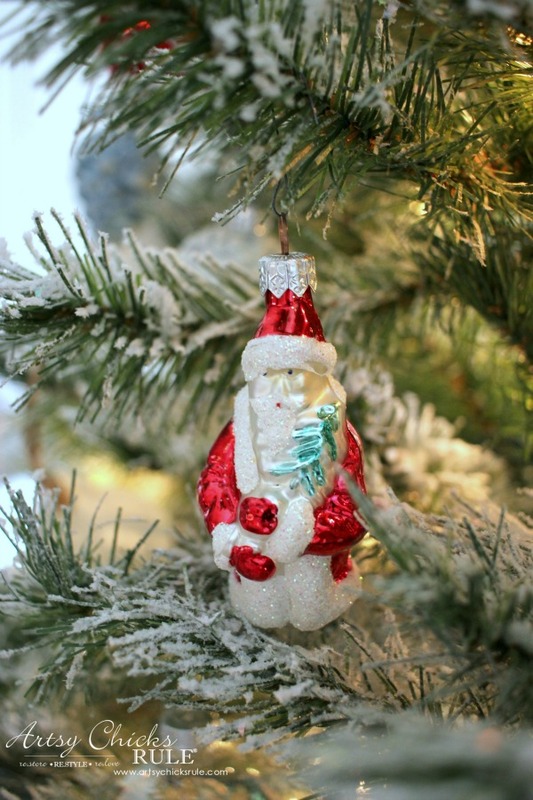 A little more close up of the tree…. It actually held up quite well to storing and putting back up. I did lose a little flocking but not enough that I needed to re-do. I can see that maybe after a few uses I may want to touch up here and there but nothing is needed yet. I kept the red, white and blue theme on the tree as well. And some Shiny Brites I found at TJ Maxx also…. You can see the flocking on the tree better in this photo. 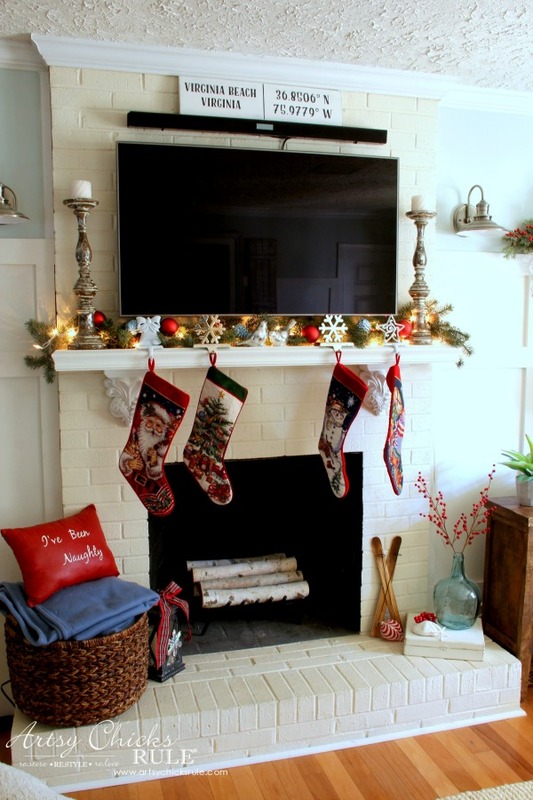 The fireplace got a little makeover too. In it’s place I put a grate and some birch logs. The “naughty” pillow is one I painted a few years ago. 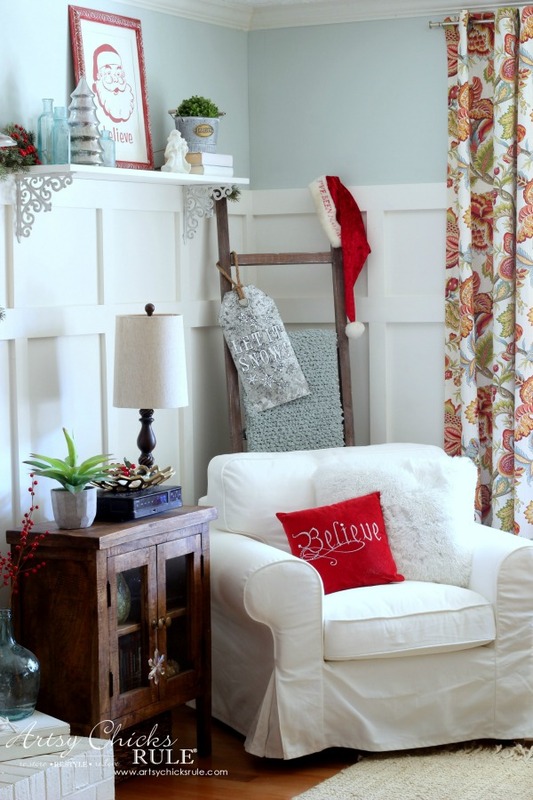 You might have noticed, and will notice, I added lots of red berries throughout my home. 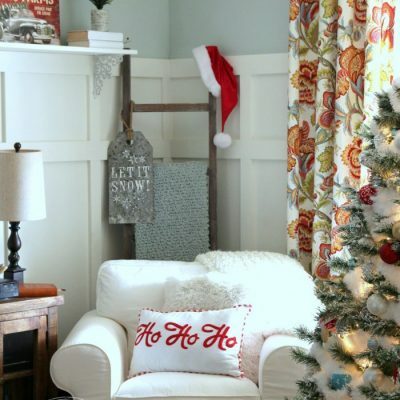 It was an easy and inexpensive way to create a festive holiday feel and add little pops of color. 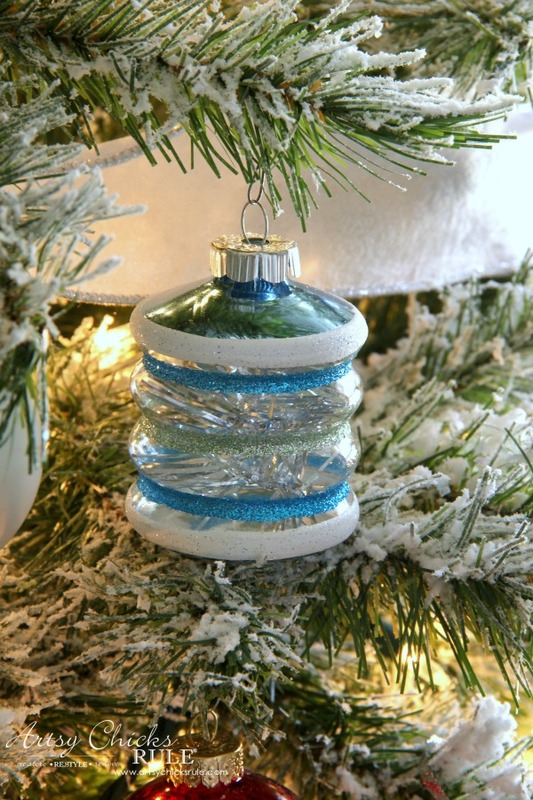 The long stemmed ones were added to jars, antique blue bottles, wreaths and more. The little one you see there I laid in dishes, etc. Both are from Michael’s and were 50% and 75% off. Can’t beat that! I thought the reflection in the TV was neat…. The stocking hangers were all found at the thrift store over the years. 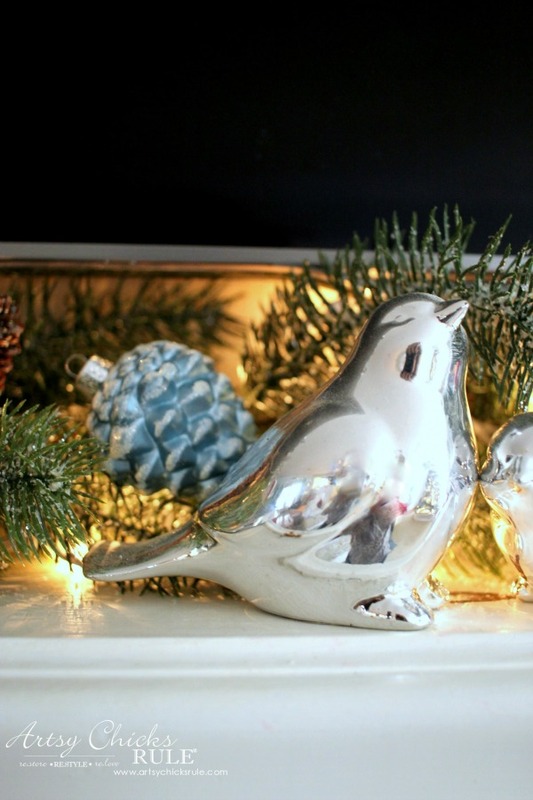 And these little guys live here all year round…. 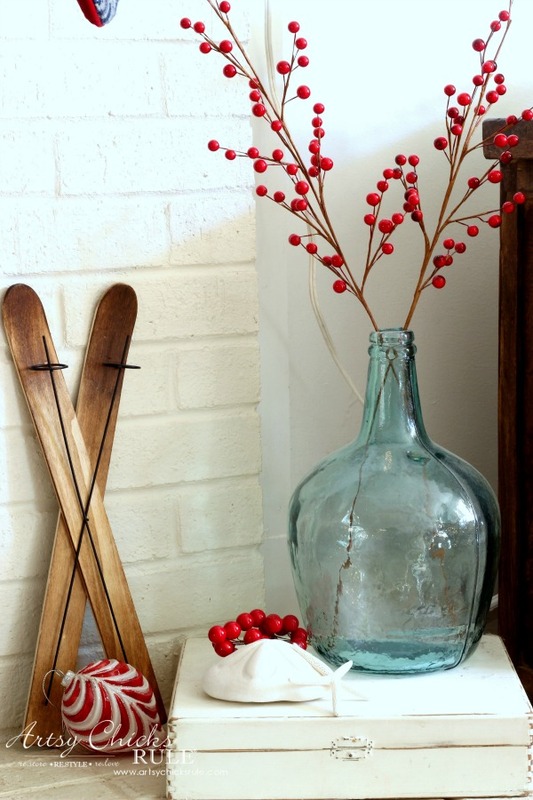 As well as adding red berries around the house, I also added these little peppermint sticks here and there. 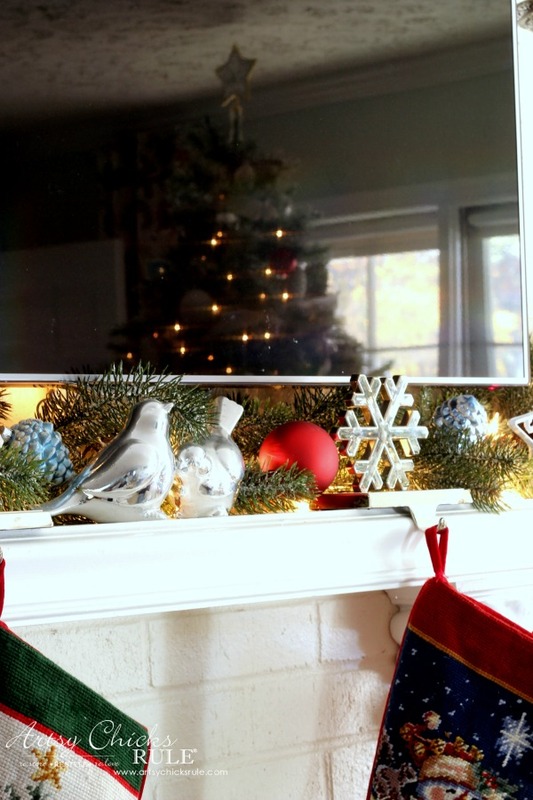 They came from the dollar store and add such a fun, festive touch. The votive candle holder was a perfect fit for them. I added white berries to this wreath and an ornament in the middle. I added berries of some sort to all of my “year round” wreaths. 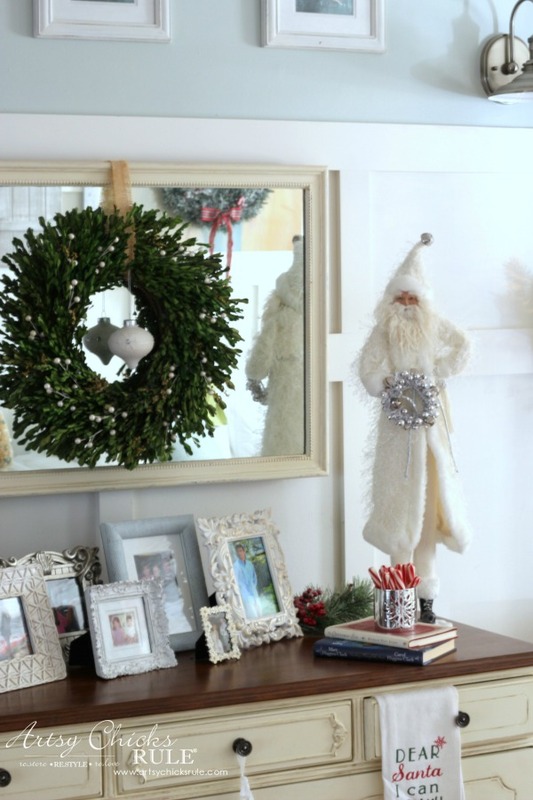 It really makes it so much easier than replacing (and storing) bunches of different wreaths. I cut the berries off at the stem (3-5 berries are in each) and just stick them in and around the wreath. When Christmas is over, I’ll just remove them, stick them in a ziploc bag and reuse next year! 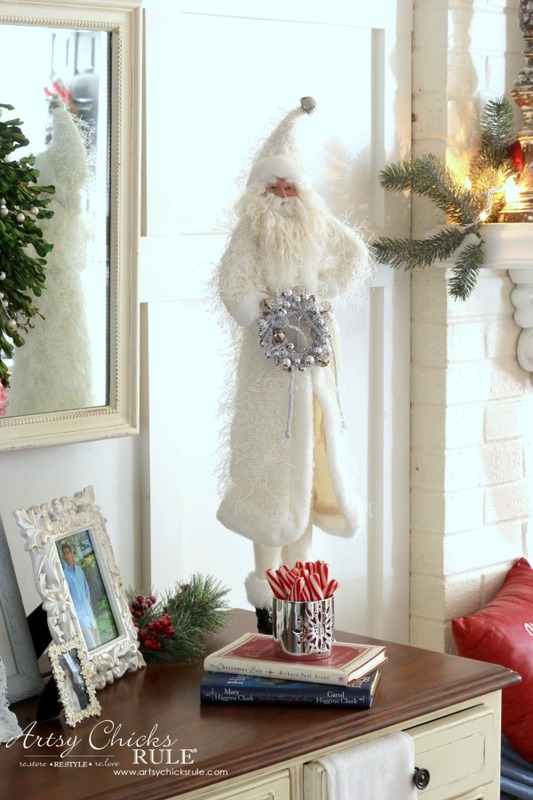 The “shutters” on each side of the french doors got these little thrift store wreaths again. 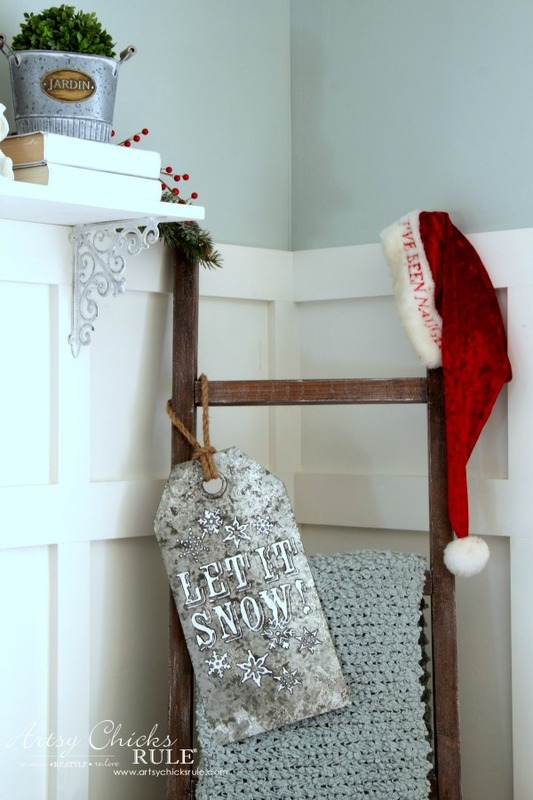 And a sweet little red and white stocking on the cabinet. 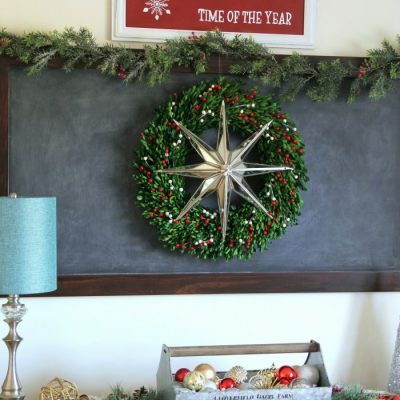 I hung one of the wreaths I flocked last year over the artwork again. The red snowflake throw also came from TJ Maxx. It’s white and shaggy on the other side just like the pillow in the chair. Love it! 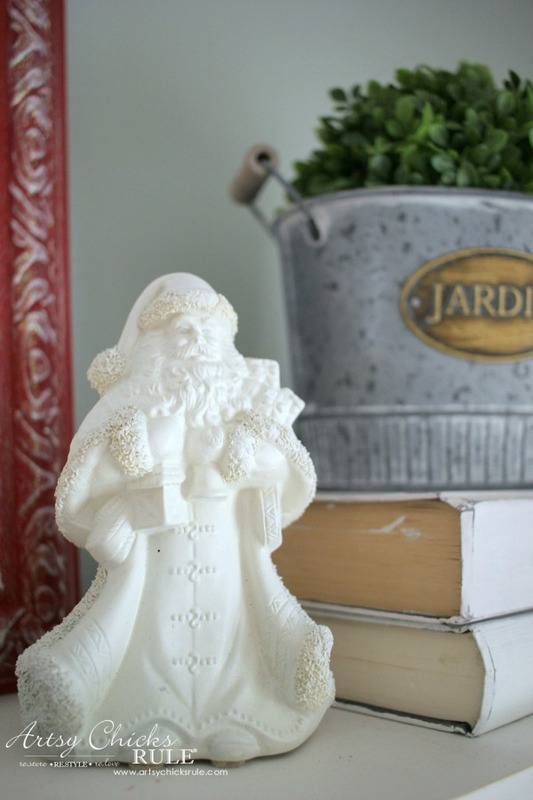 I added a few small Shiny Brites, a red ornament and a hang tag to this bowl. The hang tag was on a box of “the best ever” shortbread cookies that my daughter made and brought to Thanksgiving. And yep, the lamps are winners……except I’m going to dry brush a bit of pale aqua over them. I’ll be sharing them in the new year too. Isn’t that crate fabulous? I know it’s probably not everyone’s choice in decor but it makes me so happy. I love that it’s old and the wood color is a nice contrast to the white furniture. Plus, what better way to store magazines? They are a perfect fit. He’s not allowed on the white furniture but we do allow him to get on the ottoman. He loves it and jumps right up and hangs out there. Hopefully he’s done growing or he won’t fit! How could you ever say no to that sweet face??? Well that’s it for today’s tour. Check back later this week for Part 2 (kitchen, study and dining room). 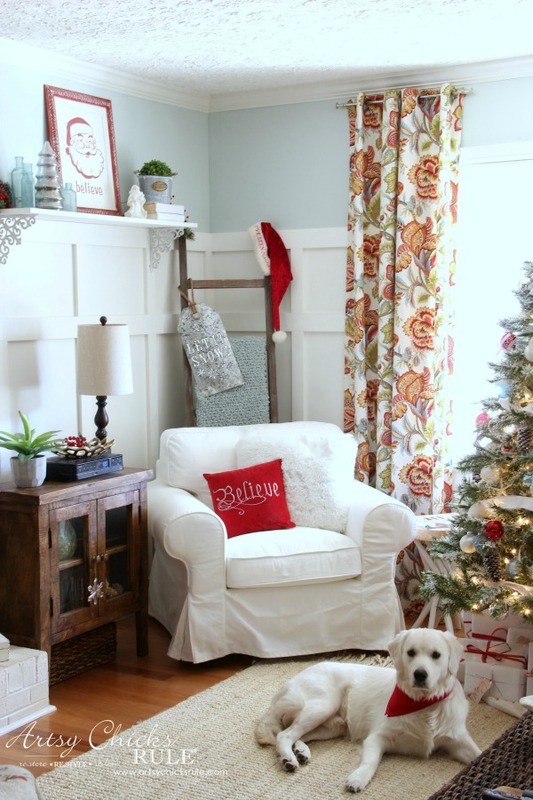 Plus my decorating enthusiast friends are sharing some fun Christmas related posts too. 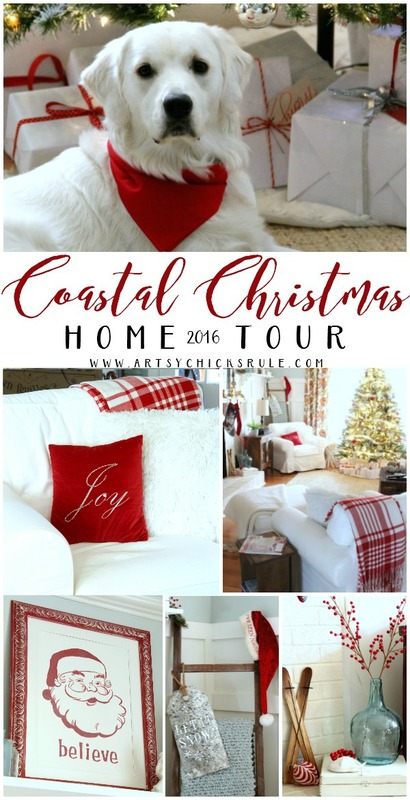 PIN this for later for Coastal Christmas Home Decor inspiration and ideas! I love the red and white. Not sure why just the contrast between the colors is so vibrant to me. 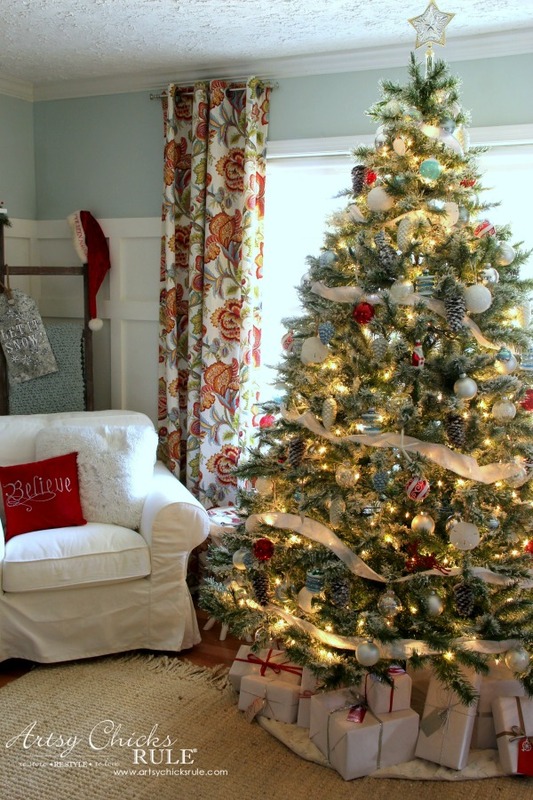 I even have a white Christmas tree and just red ornaments and almost all (90%) of my other decorations around the house are all red and white also. So you know I love this!! Very pretty! I love that you didn’t max out the space with color. 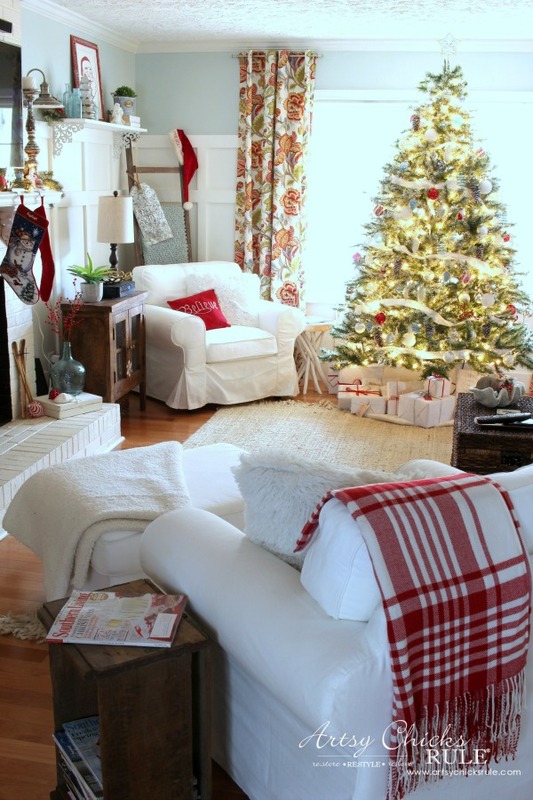 The pops of red are perfect and I do love that plaid throw! hey girl love the house! So pretty! And Ryder is so cute! Lovely home. 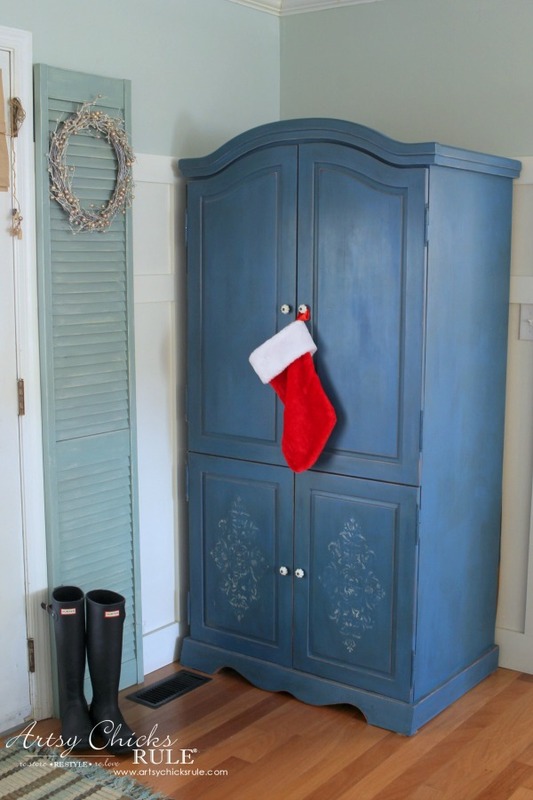 That blue cabinet is great. You decorated nicely. Beautiful!! 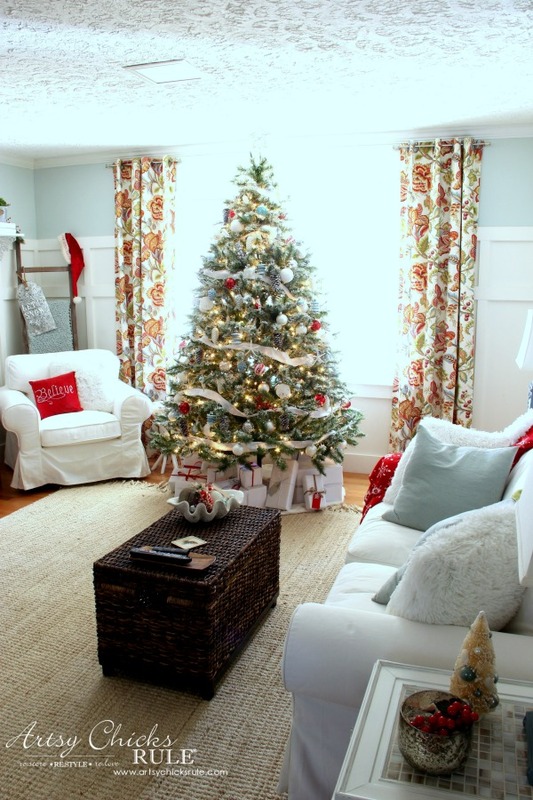 I could spend all of December in your pretty living room. 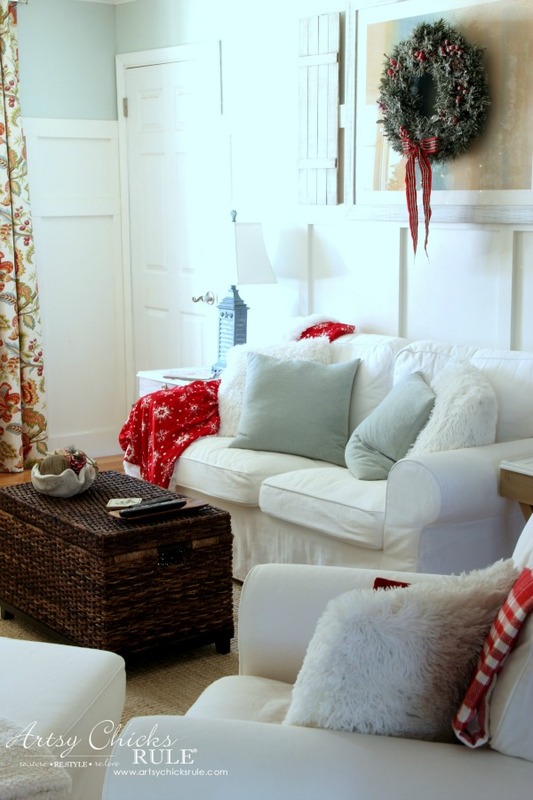 The red looks great with your new white furniture. 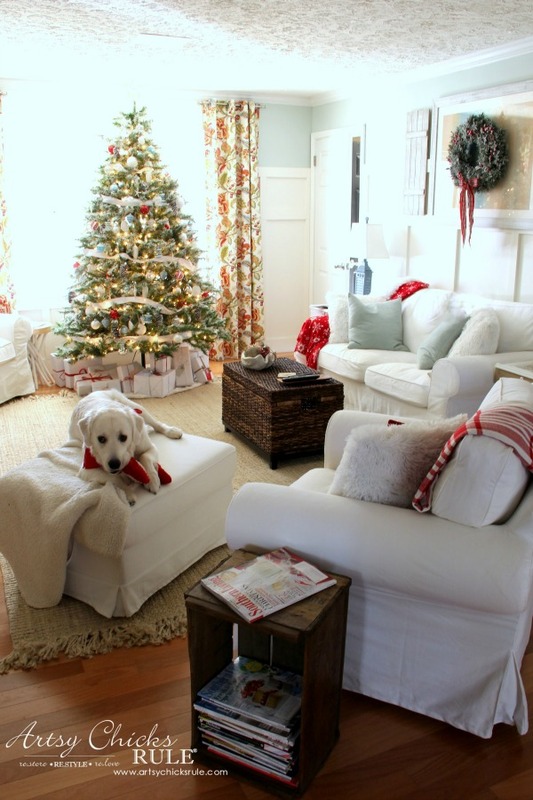 It is better than a magazine layout of a perfect Christmas room, beautiful white dog included. Love, love, love the colors and the new and old accents in the room! You really have a gift! I love the white wrapping paper. Where did you get it??? Thanks! It’s actually a large white roll from Amazon. I use it to line my island when I’m doing crafts in the kitchen. ;) I thought it would work nicely for the presents…and it did! Although it’s a bit see through on some. I will look it up and edit the post under “materials list”. Try back in a bit for the link to it there. Oh my goodness, Ryder matches the living room and judging by his pose, he knows it! 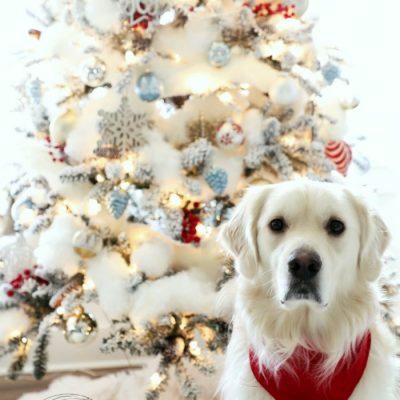 Ryder, The Christmas Mascot – how adorable. 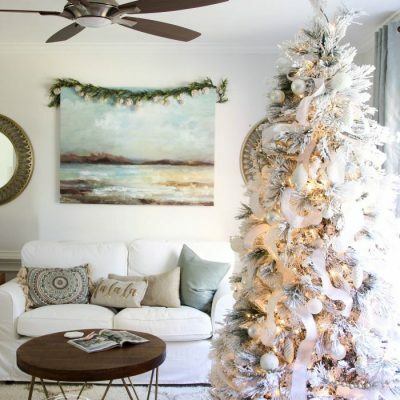 Now I know where your flocked tree went – just left a comment on Day 3 wondering where it was.